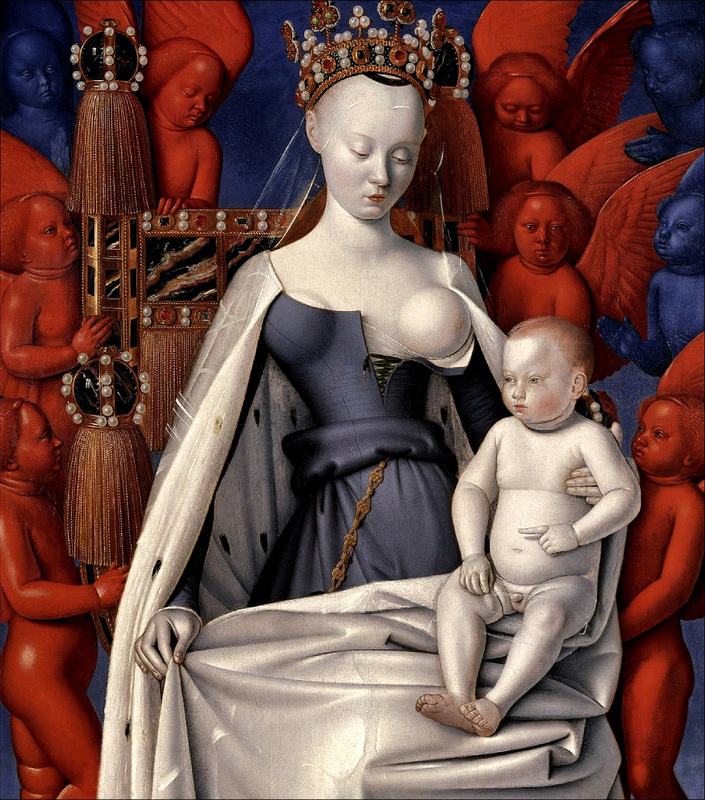 Ask me about a Madonna and child painting and I will ALWAYS show you this creepy work by Jean Fouquet. The old idiom “white as a sheet” definitely applies to the protagonists of this painting. The Virgin and child are alabaster beyond belief, and the highly saturated reds and blues in the background only heightens their strange pallor. There’s not a ton of colors but the sheer intensity of the ones we get are meant to drive home the point of their symbolism. White indicates celestial purity so mom and baby Jesus are obviously super holy. Think about that before you get your next spray tan. Despite her obvious shortcomings in the breastfeeding department, there are lots of fat, stolid babies hanging around. Aside from the righteous, finger-pointing JC, there are a bunch of other naked infants with wings, known as cherubim, creeping in the background. Their colorful presence is meant to make the heavenly scene more otherworldly. In reality, they’re just freaking everyone out. The painting was commissioned by Étienne Chevalier, treasurer to the King. You can see Chevalier in the non-Madonna panel (scroll right to see the image), kneeling down in the puffiest shirt ever. Saint Stephen’s the guy standing there looking bored. 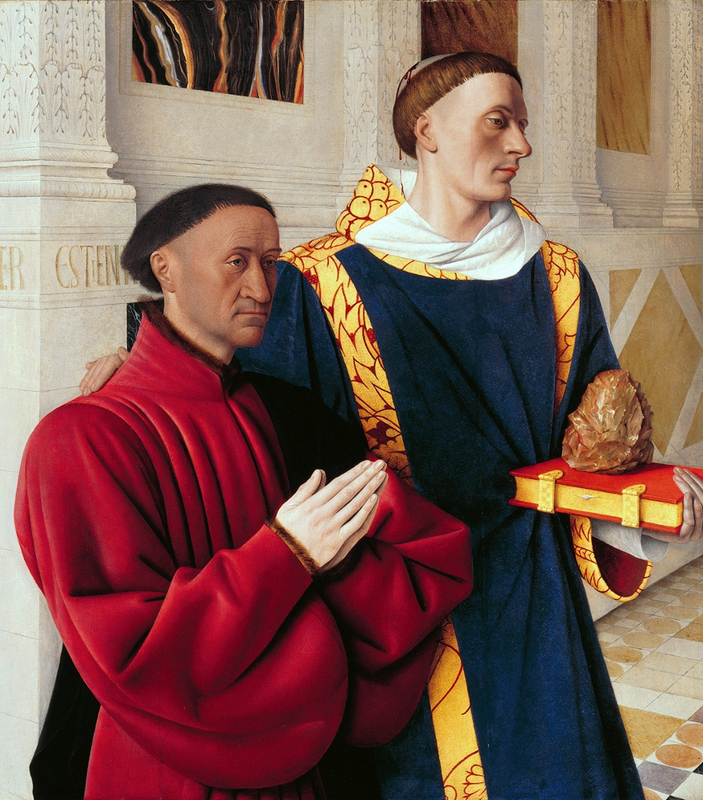 The stylish duo both have a strange ring of hair, known as tonsure, which was the standard male hairdo during medieval Catholicism…unfortunately for medieval men. Though baldies today may wish it'd make a comeback. The Melun Diptych is a two-panel oil painting by the French court painter Jean Fouquet (1425–1480) created around 1452. The name of the diptych came from its original home in the Collegiate Church of Notre-Dame in Melun. The left panel depicts Etienne Chevalier with his patron saint St. Stephen and the right panel depicts the Virgin and Christ child surrounded by cherubim. Each wooden panel measures about 93 by 85 centimeters and the two would have been hinged together at the center. The two pieces, originally a diptych, are now separated. The left panel now resides in the Staatliche Museen in Berlin and the right panel is now located at the Royal Museum of Fine Arts, Antwerp, Belgium. A self-portrait medallion is also associated with the two panels. Measuring 6 centimeters in diameter, it would have adorned the frame, and consists of copper, enamel, and gold. The medallion is now located in the Louvre in Paris, France. Check out the full Wikipedia article about Melun Diptych.